No, it wasn’t the extra drink you’d had last night. 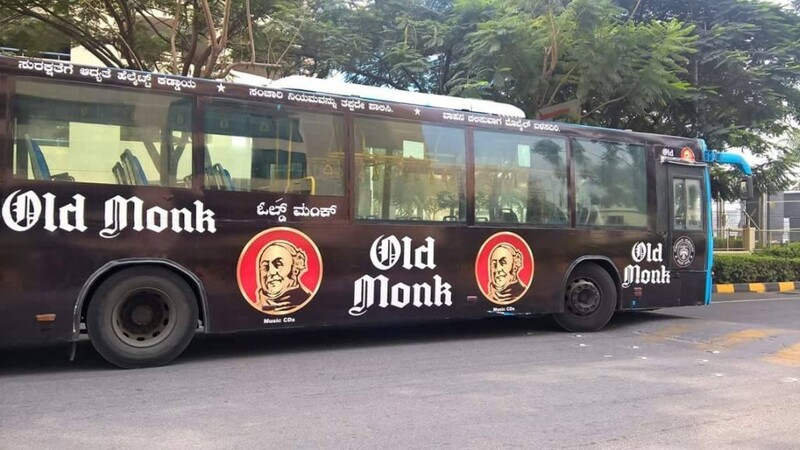 Old Monk buses are really plying on the streets of Bangalore. Bangaloreans have been bemused – and somewhat taken aback – by the sight of a few BMTC volvo buses bearing the iconic Old Monk logo. Bangalore is home to the country’s largest engineering population, and Old Monk retains a bit of a cult status among Indian engineering graduates, often being the only drink of choice for young, cash-strapped students. You’d almost feel that the drink needed no more publicity in the city, but clearly Mohan Meakin, Old Monk’s parent company, thinks otherwise. It’s gone ahead and emblazoned its logo on BMTC buses. And if you’re wondering how a rum brand is allowed to advertise itself on government property, look closer – the logo says Music CDs in tiny letters below the logo. This is a classic case of surrogate advertising, and is a common tactic for alcohol brands to showcase their products without plugging the alcohol per se. With Bangalore being the pub capital of India, it’s probably fitting that an iconic rum brand finds pride of place on its buses. We imagine that the buses are going to become a bit of a selfie magnet for young students in the coming days. And if they could play some Pink Floyd on the PA system, things would be just perfect.